Link to the full invitation (English and hindi) - https://docs.google.com/open?id=0ByVemcKfGLucTHdCRVBlNmQ1eEU. vAnamAmalai is popularly known as nAngunEri. located about 25 kms from thirunelvEli. Bus facilities are available from thirunelvEli to nAngunEri. Generally buses going from thirunelvEli to nAgerkOyil will stop there. But please check with the conductor since some buses go on the by pass road without entering the temple town. Bus/train facilities are available from Chennai to thirunelvEli. There is also a train (ananthapuri express) which goes from chennai to thiruvananthapuram which stops exactly at nAngunEri. Nearest airport is in thiruvananthapuram. Madurai is also nearby which has an airport. 10.30 Am – Inauguration ceremony – Presided by SriMath Parahamsa ithyadhi SriPerumbudhur Appan ParakAla EmbAr Jeeyar Swami, inauguration speech by Sri R.Thothathri swamy, followed by Vidhwath sadhas on vaLLal Bhagawadh Ramanujarin Vazhi Vandhavargal by various vidhwAns. 7 P.M. : Musical programme. 10 Am – vEdha pAryAyaNam inaugurated by SriMath Parahamsa ithyadhi PerAruLALa Ramanuja Jeeyar Swami, Thirukurungudi at aranganagarappan sannidhi, srI matam. 5.30 PM – upanyasams by various vidhwAns, followed by a musical programme. 10 Am – vEdha pArAyanAm headed by SriMath Parahamsa ithyAdhi EmperumAnAr Jeeyar Swami, AzhwAr Thirunagari. 10 Am – vEdha pArAyanAm sARRumurai headed by Sri Sri Vidhya Bhaskar Vasudevacharya Swami, Kosalesa Sadhanam, Ayodhya. Speech by Srimath Parahamsa ithyAdhi Thirumalai Thirupathi PeriyaKellviAppan Sri SatakopaRamanuja Jeeyar Swami. Welcome Note by Sri VAnamAmalai matam AsthAna VidhwAn K.B. Devarajan Swami. Followed by Sri MathParahamsa ithyAdhi Sri Kaliyan VAnamAmalai Ramanuja Jeeyar Swami. 6:00 A.M. Mangala Isai Sri VAnamAmalai Matam AsthAna Nadhaswara VidhwAn Sri Muthukumara swami and group. 7:15 A.M. Mahasudharshana Homam for World Peace at VAnAmAmalai matam. Those who wish to participate in this Homam can do so by doing Rs 1000/- SambhAvanai and at ther end of the homam will receive Sudharsana Yanthram. 9:30 A.M. Sri VAnamAmalaiPerumal Special Ennai KAppu. 12:30 P.M. SAtrumurai, Theertha Viniyoga Ghoshti. 1:30 P.M. - DivyaDesa Theertha Prasada MariyAdhaigal for our Sri Swami. Special Program (on Dec 6th). 4:00 P.M. SriMAn R.K. VAnamAmalai, Head of Sri VaraMangai NAchiyAr Bhaktha Sabha. 4:15 P.M. GopuravAsal Mandapam- SadhAbhishekha Malar will be released by SriMath Parahamsa ithyAdhi SriMath Andavan Swamigal, the first copy to be presented to our SriMath Parahamsa ithyAdhi Sri Kaliyan VAnamAmalai Ramanuja Jeeyar Swami. srimath Parahamsa ithyAdhi Thirumalai Thirupathi PeriyaKellviAppan sri Satakopa Ramanuja Jeeyar Swami. Srimath Parahamsa ithyAdhi Sri Perumbudhoor Ethiraja Jeeyar Swami. Srimath Parahamsa ithyAdhi Azhwar Thirunagari EmperumAnAr Jeeyar Swami. 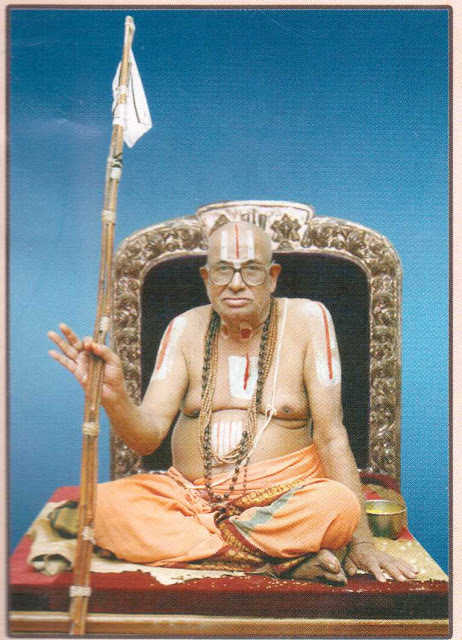 Srimath Parahamsa ithyAdhi Bheemavaram Ramachandra Ramanuja Jeeyar Swami. SrimathubayavE. Thirukkovaloor EmperumAnAr Jeeyar Swami. Navathiruppathi (Azhwar thirungari, etc) - Can be reached from vAnamAmalai by Auto (1hr) or Bus (2hrs). Have to go through thirunelvEli since this is in a different direction. Arranged in a few mandapams near the temple. Also, there is thadhiyArAdhanam at the mutt itself but usually it will be around 1pm when it starts. Few other facilities near by the temple. Note: Thanks to aruNA ammangAr for gathering these information from the invitation.